My first jumpsuit and I love it! I’m long through the trunk so it’s hard to find one that works. I sized up in this one and it fits nicely through the trunk and I can snug up the waist with the tie. Nice thick fabric. I definitely recommend! Fits beautiful and looks great on. I have this in the black too. Very versatile. Always get compliments when I wear it. Fit is very flattering for all ages. Beautiful jumpsuit and I am sure it looks great on most people, however on me it just was not flattering and because of my wider hips it just looked too tight on the bottom. Don't pass this one over! 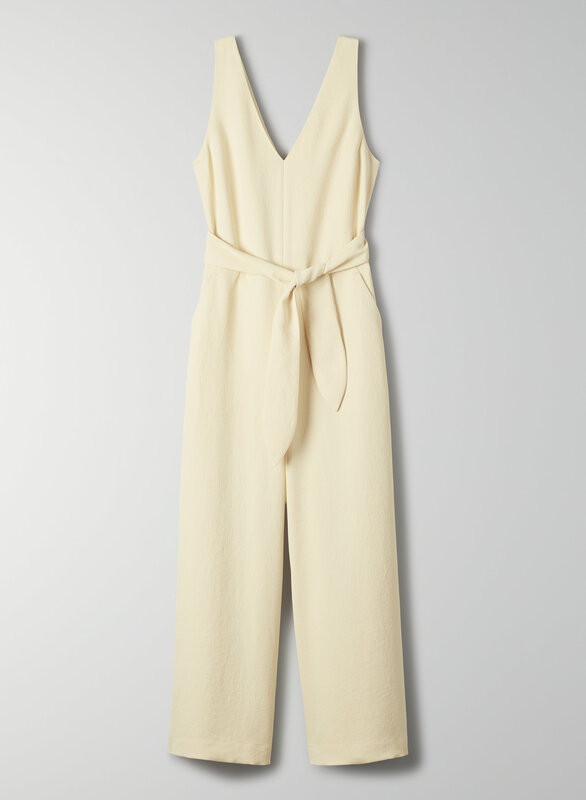 I spent a lot of time looking at this jumpsuit without trying it on. I always thought it looked great, but was afraid the fabric could feel a little formal or uncomfortable. However I finally took the plunge this year and bought it in the light grey and it is exceptionally comfortable (since it's lined) AND flattering! Wore it for my bday and got lots of compliments. Only thing is the belt slid out about 5x. Fits slightly small, I went up a size and it fits perfect. Super flattering and classy looking. Love the colour (Ashen), design and fabric. But it was too short the body for me.